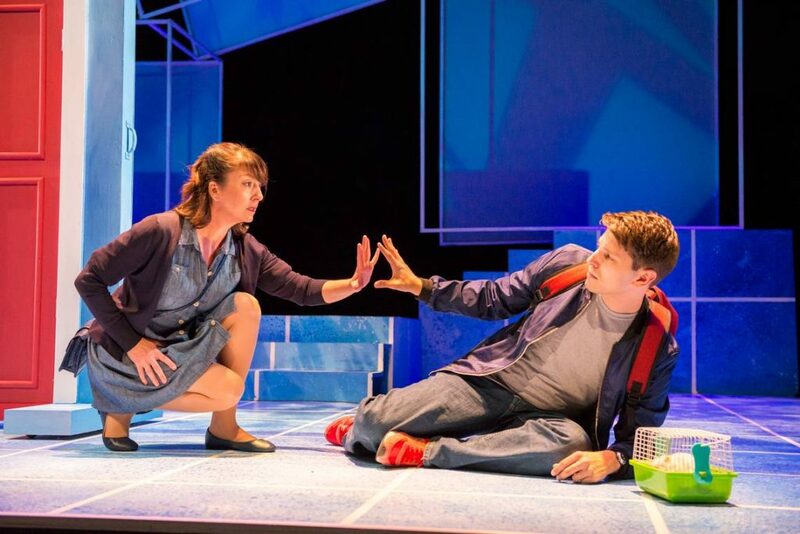 Niki Fridh and Ryan Didato in The Curious Incident of the Dog in the Night-Time. For a work brimming with pure theatricality, few plays can top The Curious Incident of the Dog in the Night-Time, the tale of an autistic teenage boy’s struggle to make sense of the world around him. Following critical and popular successes in London and on Broadway, the play is now available for stylistic reinterpretation by resident companies, which must have been catnip for Zoetic Stage’s artistic director Stuart Meltzer. He certainly manages to encompass the harrowing saga of Christopher Boone on a simple, grid-lined stage with a Story Theater style that draws on the energies of a nimble cast as well as the audience’s imagination. At the center of this fine ensemble is Ryan Didato as Christopher. He’s a tad old for the 15-year-old, but he otherwise expressively conveys the remarkable character with all his tics, twitches and tantrums intact. The play, adapted by Simon Stephens from Mark Haddon’s best-selling novel, takes us inside Christopher’s fevered brain, as does Didato. Constitutionally incapable of lying, he tells us exactly what is on his mind, devoid of metaphors, a concept he cannot abide. Nor can he stand being touched or the color yellow, just a few of the quirks that make raising him such a challenge for his father Ed (Stephen G. Anthony), a man of limited patience and a violent streak. The play opens with a stark image at center stage – a large, lifeless dog, impaled on a pitchfork. Recognizing it as his neighbor’s pet, Christopher vows to turn detective and deduce the animal’s killer, despite his father’s exasperated admonition to stay out of other people’s business. With the killer’s identity, Christopher also learns that his mother – whom he was told had died in the hospital – is very much alive and living in London. So he embarks on a train and subway journey from his home in Swindon to reunite with her, a harrowing trek of sensory overload as rendered by Greg Duffy’s animations and Steve Covey’s projections. Didato is onstage throughout the two-and-a-half-hour running time of the production, giving a fierce, well-observed performance of extreme physicality and fragility. Most of the rest of the 10-member cast are fleeting supporting characters and stage hands, wheeling about door frames and skeletal cubes that define the ever-changing playing spaces. Beyond them, Anthony and Fridh are standouts as Christopher’s parents, as is Gretchen Porro as his high-empathy teacher, who narrates by reading from the teen’s journal. With The Curious Incident, Zoetic Stage continues its string of challenging play selections, challenging for its company and for its audience. THE CURIOUS INCIDENT OF THE DOG IN THE NIGHT-TIME, Zoetic Stage at the Arsht Center, 1300 Biscayne Blvd., Miami, Through Sunday, Feb. 3. $50-$55. Call (877) 949-6722 or visit www.zoeticstage.org.